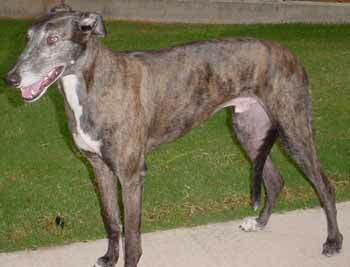 Rootbeer, aka AW Rootbeer, is a dark brindle handsome 5-year-old male greyhound, born in May 1996. Rootbeer's whole litter was named after soft drinks, and his name reflects the beautiful rich color of his coat. His foster mom describes him as the perfect greyhound: sweet, loving, quiet with an extra added bonus - he is cat friendly! 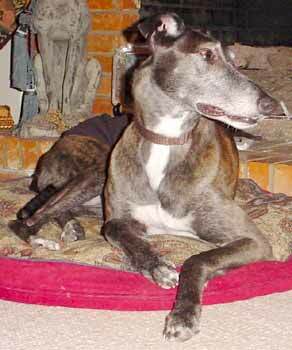 Rootbeer gets along very well with other greyhounds, and loves the companionship of humans.